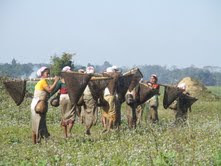 The Morans are mostly found in the Dibrugarh and Tinsukia Districts of Assam. Larger concentration of this population exists in the eastern extremity of the Tinisukia district, and those inhibiting in this region are traditionally known as Morans of the Samarpith. We often find that Moran-Matak as a single nomenclature is simultaneously used and sometimes they are also called the Mayamaria or Moamaria. This creates a some kind of confusion to the people who visit them. It seems sometimes that Moran and Mottok are synonymous to one another. This juxtaposition, however, is confusing, but provides some interesting aspects of their socio-cultural and historical blending of their ancestral past. Prior to 1251 A.D., the region between the Brahmaputra and the Burhi Dihing in Dibrugarh district, was called Matak country and was ruled by Bor Senapati. (Sipra Sen 1999:154). Matak is a politically organised, greater community formed by several groups of tribal and folk communities who belonged to a Mayamaria/ Moamaria sect of Vaishnav religion. According to S. Dutta (1985:20), Moran is a tribe, Moamaria or Mayamaria is a sect whose followers are called Maomarias or Mayamarias and Matak is a community which includes all the disciples of Mayamaria Satra belonging to different castes, tribes and professional groups. The Morans constitute one of the very old ethnic groups and on the basis of their racial and linguistic affinities, they are ascribed Bodo origin. The Morans of Samarpith area identify themselves as the people who devote their life with the domestication of elephants. According to a native of Ubon villager Sri. Dilip Moran, "elephant is our cultural property and we have been living together since time immemorial. Our ancestors came to this land with elephants”. and riddles used in the social life of the Morans are complemented to the elephants. They have a wealth of traditional wisdom which they apply in reading the mind of an elephant. They have good knowledge of elephant behavior. 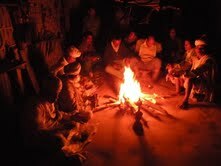 In some instances, the Moran celebrate Hati Bihu in honour of their elephants. Moran people were expert in catching and training elephants, the Ahom elephantry was practically monopolised by them. Because they were brave warriours, they also contributed a major share to the man-power of the Ahom Army. Thus the service of the Morans was of great help in the expansion and consolidation of the Ahom power in Assam (S.Dutta 1985). Traditional Moran houses are very few in existence. Even in the Samarpith belt, where larger concentration of the Moran tribe is available, only three traditional houses are found existing. Among these houses, the one which is located at Ritukothalguri village is the oldest and aged about half a century old. Now-a-days, Moran villages and their settlement patterns had undergone a great deal of changes. It is difficult to distinguish them from other communities at an instance. Apart from these changes, they had retained and continue to use some of the basic structures like Bhoral ghar (granary), Randhoni ghar (the place of Randhon-cooking members of the house), Sora Ghar (a place of the household head). This traditional spaces are more or less existed in an innovated forms but the elements of culture and tradition are still in practice. Morans live in a joint family. Father or elderly male member being the head of the house is obeyed by all the members of the family. No separate hearth is allowed to use in the family unless a new establishment of the married son is allowed to set up. Moran settlement are found often in close proximity of the jungle and those inhabiting in the Samarpith area are surrounded by a thick natural forest cover to the east extending Myanmar and Arunachal Pradesh. According to the Morans, this is the home to a large number of wild elephants.Fenced with uniformly weaved bamboo fencing, Moran settlement at present gives a clear demarcation of family and individual landholdings. Apart from the common house, Moran habitat also consisted of Bhoral ghar, Guhali ghar, Tantor hali and Hahor goral. Traditionally, Moran house is constructed in a rectangular ground plan with an extension of Kitchen as another segment of the house followed by rooms for the family members. The house is constructed with bamboo as wall structures and roofing frames, Jengu/ Toko Pat as thatching leaves, Komor Khuta, Pasor Khuta, Soti etc. as wooden pillars, post and beams. Huge wooden pillars and beams called Komor Khuta and Soti are used in the interior super built up structure to support the entire house. The appropriate use of Komor khuta (huge wooden pilllar) rested horizontally with Soti (wooden beams) presents a magnificent look of the house from interior and these massive wooden structures symbolically represents the power and strength of an elephant and believed to withstand from any kind of untoward incidence of natural, man and spiritual forces. Their traditional house has a reserved place in the front the front varendah called Arula. This space is used especially for keeping the belongings of their elephants. The Moran house has three rooms arrayed with bamboo wall partitions. The front hall called Sora ghar is regarded as the most important part of the house. This common room has a fire place called Jui Hali, and surrounding of which is a meeting place. The space adjoining to the main Khuta (pillar), is the place for the household head. According to the Moran tradition, Jui Hali (fire place) should remain litted all the time through out the year, be it winter, summer or rainy season. It is the place where every important decision of the family is taken. Morans are very hospitable, and those who visit them are given warm welcome. The guests have to take their seat in the Sora Ghar, where various items of food, tea and fresh Tamul-\pan etc are offered to entertain them. Hanging platforms are used above the Jui Hali to preserve food items and also for stacking items of household use. Dhenki (husking lever) for pounding grains are generally installed or kept in this room. The main entrance door of the house lies at left side of the front wall and this serves as a corridor which is unidirectional with another door passing to other rooms like Huwa ghar. Side door called Pet Duwar lies at the left side wall. It is used by the family members especially the women when respectable persons are present in the Sora Ghar. Adjoining to the Sora Ghar is the Huwa Ghar (Bed rooms) and sometimes extended with partitions depending upon the number married Sons and family members. with the female member of the family who hold the responsibility of cooking. The one who prepares meal for the day becomes Randhoni of the day. Randhoni alone for the day, holds the complete responsibility for managing, preparing, serving of food for the family and any guests who visit them. She takes utmost care in satisfying all those, who seat to taste the Meal prepared by the Randhoni. Meals are generally served at Randhoni Ghar. It is arranged in a fashion that, members can easily take their seat in a descending order, depending upon the age groups. Unless, all the members complete their meal, it is a tradition that one should bear in mind to avoid untimely lifting up of their hands from the dish/ plate as a mark of respect. When all the members take their meal, the Randhoni sprinkles some water and rub on the floor preparing a circular pattern. This traditionally marks the completion of Meal. The Bhoral Ghar (granary), that lies in the courtyard is apparently more interesting. The Bhoral structure is unique, and raised upon nine pieces of wooden log that are arrayed in rows. These logs are called Lotikai that sometimes are very huge ranging from 3 to 5 ft in diameter. Use of Lotikais in the Bhoral structure, is meant, not only to provide firm support to the entire structure, but also to present the underlying idea of their socio-cultural and economic relation with their elephants. It is said that in the olden days, rich people among the Moran used to construct as many as Bhoral ghar, some of which, they construct in the name of their elephants. They do not consume grains from those granaries which are dedicated for their elephants. They rather spend it for the care of their elephants. Bhoral Ghar has four side-walls covered with tightly weaved bamboo matted structure. This raised structure is constructed in a manner that it looks proportionate with the size of logs they use. Roof structure is two-sided and thatched with locally available leaves called Tokou pat/ or Jengu Pat. It is generally believed that the grains should be stuffed inside the Bhoral ghar in such a way that it virtually represents a fully eaten and pot-bellied elephant sitting in the yard. The side walls of the granary are used for keeping and hanging agricultural implements, fishing tools and sometimes large size ropes for elephants. The position of the Guhali Ghor is generally in south direction to the Sora Ghor. It is a simple shed without any wall structures. Guhali ghor is used as cow shed for keeping domesticated Cows and Bulls. Tantorhali is a separate shed prepared in a convenient place keeping looms and other weaving materials. Female members of the family weaves clothes in this shed. The position of the Hahor Ghoral is generally in west direction to the Sora Ghor. Hahor Goral is circular bamboo enclosure raised and shortened to the top. It is used for keeping Duck, Goose etc. Remembering the past, Sri. Tarun Madhav Moran narrates, “two and half decades from now, there were 15 to 20 Elephants in every Moran villages. The surrounding of Moran inhabiting areas were abundant with large vegetation and thick forests. Those days every family of the Moran were capable of constructing the unique traditional house of this kind. But with the passage of time, the Morans gradually became unable to support their elephants as the forests and grassland got reduced with the intervention of human activities of felling trees and destroying the jungles. Middle class families among the Morans used to engaged their elephants for transporting these logs from one place to another and one could earn handsome money and could afford to feed their elephants. Now-a-days, they are unable to keep an elephants. Keeping elephant in a Moran family was not only the matter of pride and prestige, but also a symbol of identity among us”. It seems that the traditional design and structure of Moran house is not only determined by the environmental conditions alone but also have a great influence of culturally defined elements, that gives a clear picture of their age-old co-existence and harmonious relation with the elephants. A team of IGRMS conducted extensive field visit to the Moran villages in Tinisukia district of Assam. An attempt have been made to collect and transport the material cutural items of the tribe together with traditional housing materials from the villages. Museum have been successful in adding traditional Moran house in its open air complex. It was in the month of April and May 2010, a team of Moran people from the villages of the Tinsukia district of Assam were invited by the museum. They had constructed their house and exhibited many items of their cultural belongings. The Moran house as an exhibit is ready and open for the visitors. 3. 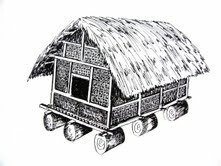 Mahapatra Sitakant & Patnaik Nityananda (1986), Patterns of Tribal Housing, Academy of Tribal Dialect and Culture, Orissa.